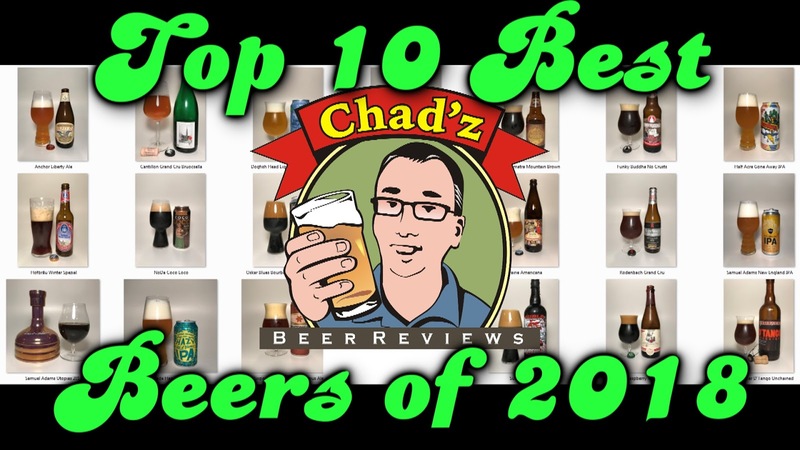 Probably the last "Top 10 Beers of the Year" list I'll ever make since I retired from beer reviewing this year. Standard rules apply: only beers which I reviewed for the first time this year were eligible for this list. Re-reviews don't count (which is kind of a shame because I re-discovered a lot of fantastic brews in 2018). Click on the link to see the in-depth text and/or video review of each beer. The first (and only) true pure, unblended lambic I’ve ever had. This bottle cost me about $100 to have it shipped from Belgian. Going by BJCP specs, it’s a perfect example of the 23D Lambic style. Literally. I gave it a perfect 50 out of 50 grade. That being said, it was more interesting than it was amazing. I liked all the other beers on this list better, but it was definitely one of the most interesting beers I’ve ever had. Another Belgian sour. I never really appreciated the Old World traditional sours until I started doing the BJCP-style reviews. And I had had regular Rodenbach before and liked it, but the Grand Cru is called that for a reason. A great example of the Flanders Red style. Good beer to give your wine loving friends. You should be able to get this at any decent bottle shop. This beer has been around for a long time. I think they started bottling it about 10 years ago but I just never got around to it until 2018. Brewed with grape must, honey, and a bunch of spices, It was a perfect entry for my BJCP reviews for the 36C Experimental Beer style. The recipe supposedly dates back several thousand years, but obviously they took some creative liberties to make it. I always considered this beer to be in the league of Dark Lord or even Founders CBS in that it was an absolute must have imperial stout. I remember hearing about this beer in my early days of beer reviewing and trying to trade for it, but it was just too rare and too expensive. For some reason, Surly actually distributes to Florida now and they sent bottles of the 2018 batch here, so I bought two of them. ANOTHER beer that’s been around for a long time, but I just never got to try it until now. That an Old Ale would appear on my Best Of list really shows you how I’ve progressed as a real beer aficionado and connoisseur. I’m not as big of an IPA fan as I used to be. I don’t really seek out hops the way I used to. A lot of IPAs are starting to taste the same to me these days, so it takes a lot for an IP to impress me and this one did. I reviewed quite a few Founders beers this year, but even though I had multiple barrel-aged brews I liked this one the best. It’s surprising that a brown ale would make my top 10 list. But then again, this is a coffee-infused brown ale and a really strong one at that. I’ve never been a fan of Weyerbacher. Most of the stuff they make is on par with Saranac or Magic Hat. But this beer really blew my mind. It’s a Belgian Quad base with cherries added; they age it in oak barrels so it picks up Brett. It truly is a wild specialty brew. This beer reminds me of how the Southern Tier Blackwater series beers blew my mind when I first had them. I wasn’t expecting this beer to be nearly this good, which makes it all the more impressive and memorable. I picked this for the review for 29B Fruit and Spice Beer and it definitely exemplified the guidelines well because it’s a perfect marriage of oatmeal stout, raspberry and coffee. You wouldn’t think those flavors would work but they do really well. I guess it was easy to see this coming. It was the last beer I ever reviewed after all and it’s a special, highly-revered beer for a reason. It’s also really rare and expensive, but I was able to get my body for a steal on ebay. I did have a version of this beer back in 2013 at the brewery on the Beer Bloggers Conference, which was a lot of fun. But I didn’t give it a formal review at the time, so it’s still within my rules of being a first-time review. This beer really is an amazing brewing feat and it even kind of blurs the line between beer and spirit, but there’s no distillation happening so in my mind it’s a beer. It’s hard to peg it to a style, though.